Beowulf is aided by his troop of Geats, who move valiantly to defend him. This week’s passage is one half of a complete scene. As such, it ends on a bit of a cliffhanger. Just why is it that Beowulf’s men’s swords are being used in vain? All will be revealed next week. For now, however, I think we have enough to spin some theories around. Once again, I’ll be basing my ramblings here on Robert Graves’ The White Goddess. I’m breaking this book out again because it’s what gives the most interesting reading of this passage. Though the most interesting reading isn’t always the most supported one. I’ve got to say up front that my idea here might not stand up outside of Beowulf and in our collection of known Anglo-Saxon literature. However, in the world that the poem creates and within the poem itself, I think it’s a valid way of looking at things. Grendel’s being immune to swords I read not necessarily as a side effect of his being some sort of monster. Instead I see it as an effect of his being a twisted version of the goddess’ champion. I base this in the interpretation of the first part of Beowulf as a play on what Graves points out as the trifecta of goddess, god of the waning year and god of the waxing year. Grendel’s mother is the goddess in this case, though she is, perhaps a twisted and gnarled one who lacks the power she had of old since Beowulf is a predominantly masculine poem and, at least for the purposes of this reading, an artifact of a patriarchal society. As such, a woman who may have headed her own power structure and not just occupied a high place in one defined by men (as Wealhtheow does) would be be depicted as some sort of monstrosity. As Grendel’s mother is just a little later in the poem. If Grendel is the champion of this goddess, then he could be either the god of the waxing or waning year. However, in keeping with the idea from an earlier entry that Grendel is actually the god of the waxing year whom Hrothgar hasn’t acknowledged for a full cycle of twelve years, he has begun to wane. And now Beowulf acts the part of the king of the waxing year. This changing of roles allows Beowulf to defeat Grendel because of his position. I also think that Beowulf beats Grendel because he challenges the otherwise slightly feminized creature with sheer masculinity. The two of them engage in a wrestling match, which from classical times was a thoroughly masculine sport, and Beowulf is said to have the strength of thirty men. And strength has always been considered one of the primary virtues of masculinity. Of course, that means that Grendel must be feminine, at least in some ways. I don’t think these ways are obvious, however. Looking at the poem as a whole, three things are expected of great men. They must think right thoughts, do right deeds, and speak the right words. Since Grendel does none of these he is obviously no true man. It might be a bit of a stretch (what’s this blog for otherwise, though?) but I think that Grendel’s is aggressively feminine in his devouring of his victims. Say what you will about men’s thoughts of women’s genitalia, but I think a yonic reading of Grendel’s devouring his victims is definitely valid. With all this in mind, as much of a cliffhanger as this passage is, I also think that it’s a commentary on the old matriarchal system of government. Not only is the goddess that society used to worship decrepit (I am getting a little ahead of myself there still), her champion shows no proper masculine virtue and is himself feminized. My point here is that the entire matriarchal system of a cyclical kingship that Graves outlines in The White Goddess is too feminine and not as stable as the more long lasting male kingship that was coming about during the lifetime of the scribes (if not the poet(s)) of Beowulf. But back to my jumping off point. In my reading of this week’s passage, swords don’t work against Grendel because he’s not subject to the usual ways of masculine warfare, hence Beowulf can only defeat him in hand to hand, unarmed combat. Do you think it’s useful to use one book as a lens through which to view another book? Or should you just stick with figuring out one book at a time? This week’s passage offers up some neat words. A combination of the word “cwealm” (“death,” “murder,” “slaughter,” “torment,” “pain,” “plague,” or “pestilence”) and “cuman” (“come,” “approach,” “get to,” or “attain”), together these words are taken to mean “death-bringer.” As you might’ve noticed, there aren’t any really crazy combinations for “cwealm-cuman”, but it’s neat because of how it’s used in the poem. Alliteration aside, the poet’s referring to Grendel as a “death-bringer” as he struggles to escape Beowulf’s hold and the overwhelming power that the Geat wields strikes me as a clever way to talk about Grendel the death-bringer getting adose of his own fatal medicine. It seems to me that he’s saying that Beowulf wanted Grendel to leave Heorot with a taste of the same death that he had visited upon it countless times before. Next up is “frea-drihtnes,” a combination of “frea” (“ruler,” “lord,” “king,” “master,” “the Lord,” “Christ,” “God,” or “husband”) and “drihten” (“ruler,” “king,” “lord,” “prince,” “the Lord,” “God,” or “Christ”). What’s neat here is that this is another instance of intensification through doubling, as we’ve seen in an earlier entry. Perhaps the sentiment contained in this compound word might also have become the phrase “lord and king,” too. They are both poetic terms, after all. I want to say that this compound is cool because it’s intuitive, but only “heard” is probably recognizable to Modern English speakers. It is, unsurprisingly, Old English for “hard.” The word “hicgend” translates as “mind” or “spirit”. So, literally, “heard-hicgend” is a “hard spirit” or “hard mind,” a way of expressing the idea of courage. After all, what’s courage if not a certain kind of hardness (or immovability or unwaveringness) of spirit or mind? As odd a way to express courage as saying “hard spirit” might be, it still makes sense on a kind of basic level. Do you ever find yourself doubling negatives or adjectives to intensify what you’re saying? Next week, all is revealed about the enchantment that Grendel has on himself, and why Beowulf’s fellow Geats are of no help to him in this fight. The poet continues his break from covering the fight directly and gives more detail about the Danes’ reactions before cutting back to a smugly secure Beowulf. First up this week is a bit of a nod back to last week’s passage. Last week I pointed out the word “foldbold” (l.773) and how it suggested that Heorot wasn’t just some building but a part of the landscape. Similarly, this week the poet states that it was inconceivable that Heorot could be destroyed. The only two exceptions that the wisemen of the Scyldings make, so we’re told, are cunning and fire. Either the greatest destroyer of all, a thing the Anglo-Saxons no doubt witnessed changing whole landscapes or perhaps had stories recording such incidents, or the sort of potent social disintegration that could bring down great dynasties and families. Fire or cunning. This hearkens back to last week’s passage simply in that it bolsters the idea that Heorot is this indestructible thing; only the strongest forces in nature or society could bring it down. Though, as many an academic note will tell you, this is just what happened to Heorot in the end. After various parties’ infighting and striving against each other, Heorot burned to the ground. So there’s definitely some foreshadowing here. There could even be a clever wink at actual events since there is a Hrothgar on historical record. 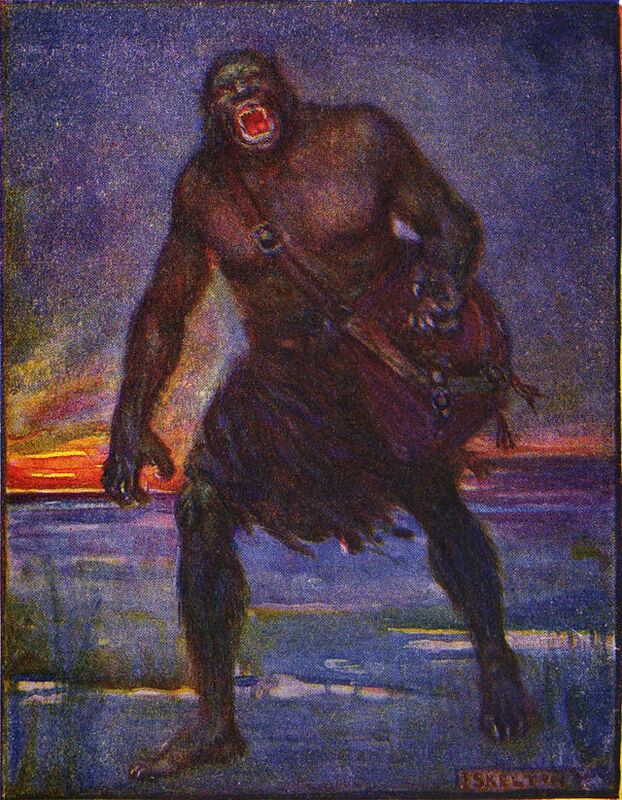 In fact, maybe while Beowulf was being sung audiences and listeners would’ve been well aware of Heorot and its eventual fall, once more bringing them a richer description of the fight since the force of Beowulf and Grendel, despite the deafening din of their battle, weren’t enough to bring the mighty hall down. The other thing to mention this week is the last line. It’s rather ambiguous. Particularly the word “þysses” (790). If this word translates as “his” then the line simply marks Beowulf as the strongest man alive during his time. But if it’s the broader and more general “this” then the poet’s throwing down the gauntlet and saying that Beowulf was the strongest ever. Period. It’s a neat little ambiguity, really. I mean, so much of this week’s passage is straightforward as far as the description of the fight goes. However, I can’t help but think that much of this is because the poet isn’t describing the actual fight. There’s no primal tumble of body over body or grip against pull to record. There’s no struggle to try to encapsulate in verse, no titanic conflict to alliterate all over. So the poet’s able to just say the Danes heard some noise, they thought that maybe Heorot would be destroyed, then they heard wailing, were terribly afraid and that’s that. Let’s cut back to Beowulf who’s now got the situation under control. Actually, it’s almost like the poet doesn’t want to describe the fight any more than he has so he’s cleverly cut away to the outside perspective of the fight. He’s still recording it, but without having to spend so much of his time on all of the special effects that would be involved in reporting on it directly. Perhaps that’s why, at the end of the passage, we’re just brought right back to Beowulf as he is sure and steady in his terrible hold on Grendel. This week, first up is a word that’s nothing like a compound. It is, in fact, a verb. This is the word in line 781 that refers to the destruction of Heorot, “tolucgan.” I’m picking on this word this week because I think one of its meanings builds on the apparent foreshadowing that a lot of scholars have pointed out on lines 778 to 782a. In Clark Hall and Meritt, “tolucgan” is defined as “pull apart,” “desolate,” or “destroy.” The last two definitions aren’t very specific in the method used to effect the destruction that they denote. But the first definition, “pull apart,” adds what I think is a social dimension to the idea that Heorot could be destroyed by cunning. I see this sense of “tolucgan” bringing in a social angle to the destruction to which it refers because what could be more cunning than orchestrating social strife and in-fighting? Pulling the socially tight knit group within a hall apart in this way could definitely destroy a place meant for merriment and sealing friendships over mead. And not just metaphorically. Sure, the break down of social structures within the hall would warp its intended function and operation, but that sort of conflict could lead to someone going and setting it on fire. Back to the compounds. First off is “banfag.” This word is a straight combination of “ban” (bone) and “fag” (dappled, decorated, decked, adorned). Though on the surface this word combination sounds pretty grim and gruesome for a place as cheerful as Heorot’s supposed to be, I think there’s definitely merit in Clark Hall and Merrit’s translation of the compound as “adorned with bone work. (deer antlers? )” (33). Antlers are, after all, a trophy of the hunt and any successful hunt would be cause for celebration. Perhaps enough of one to hoist high the inedible antlers and hang them over a doorway. Not to mention, putting antlers on a place called “Heorot” completes the name’s pun. Though I suppose it’s possible to also take this compound more literally and see Heorot as being hung with the bones of all of those whom Grendel has slain over his 12 year reign. Actually, Robert Graves, in his The White Goddess, said the cycle of sacred kings once ran for 12 years. So maybe Grendel is supposed to be the next sacred king, but Hrothgar stands for the patriarchal system of lifelong kingship and the poet/scribe is writing at a time when that patriarchal system was prevalent so Grendel’s framed as the villain. So what makes this one so interesting? Hm…good question. I guess I just find it neat how the Anglo-Saxons would describe the sound of someone (something?) wailing out in fear as a song or poem or lay of terror or horror. I mean, putting a poetic spin on something like fear just really suggests that the Anglo-Saxons understood it to be a multifaceted emotion, that there were many things packed into fear and a sort of manic-ness, a sort of schizophrenic quality to it in that one can be afraid of so many things in a single moment and fear can easily shift focus once it kicks in. Fear is all the more terrifying when it’s described this way, too, since you can’t help but get the sense that along with all of the musicality and variety implied in a poetry-based metaphor for a fearful cry, it’s also regarded as all the more bewildering. This poem of fear is like a wad of pure horror that’s being cast about willy-nilly. In fact, maybe this cry’s given this poetic status because of the power it has over people in its area of effect. The Danes are terrified out of their wits, after all. They’ve just been woken from their ale dreams by all this banging and crashing about and now there’s this terrifying scream from their hall. It’s just so much and it’s all packed into a single, poetic compound. Next week, Beowulf’s fellow Geats join the brawl.